First of all, even with whites and lights, don’t assume drivers see you at night. They may, they may not for any number of reasons. Night lighting conditions are very challenging for the eyes of drivers and cyclists. One moment, the road can be pretty dark. The next, one can be blinded by headlights. It is not surprising that crash rates rise significantly at night. Its a good idea for both cyclists and drivers to slow down and travel defensively at night. Studies have shown that while they are not perfect, lights do reduce the risk of cycling crashes both at night and during the day. The main issue with bike lights is that as they tend to be small, drivers may think the bike is further away than it actually is leading to slow reaction times. Several lights or larger lights with many LEDs are probably a good idea. But please, don’t use really bright lights that blind other people. There are even some lights designed to be pointed at the rider. I suspect this is a good idea. Like many of you, I have some dirty yellow cycling jackets lying around. I haven’t worn them in years as they are rather ugly. Turns out that yellow and other bright colours, while being highly noticeable during the day, don’t fare as well at night. In darker conditions, our eyes perceive only in levels of black and white thus yellow and other bright colours appear as grey tones that can be similar to asphalt. Yellow can particularly poor choice, especially in the rain. Yellowish orange street lights reflect off the wet streets resulting in yellow clothes being rather more effective at camouflage than letting drivers know you are there. One article on cycling safety started off by with the experience of a running coach saying that she happened to notice a jogger only by the whites of her shoes. For some unknown reason the article proceeded to talk about lights, reflectors and bright clothing without even mentioning white. White bikes, white fenders, whitewall tires, a white helmet, white shoes. The more white the better. Some other colours including black, red or green can also be helpful to provide contrast to the white helping to improve visibility in the daylight. A white top with dark pants would be a fine choice. Reflectors and reflective strips are either really effective or practically useless depend on the situation. As they reflect light directly back to its source, they are well suited for cycling on long straight flat country roads enabling drivers to see cyclists from several hundred metres away. They are not of much help at all when cycling across intersections. By the time a driver can see the reflected light, it is likely too late to prevent a collision. Reflectors are also less effective with trucks as driver’s eyes are further away from the headlight than is the case with a car. People walking don’t have headlights so reflectors will not help them see you. Reflectors bounce the light from the street lamp straight back to the street lamp and the light from the buildings straight back to the buildings. Definitely not helpful. White clothing or gear, on the other hand, will reflect some of that light from you to the driver’s eyes where it may do some good. 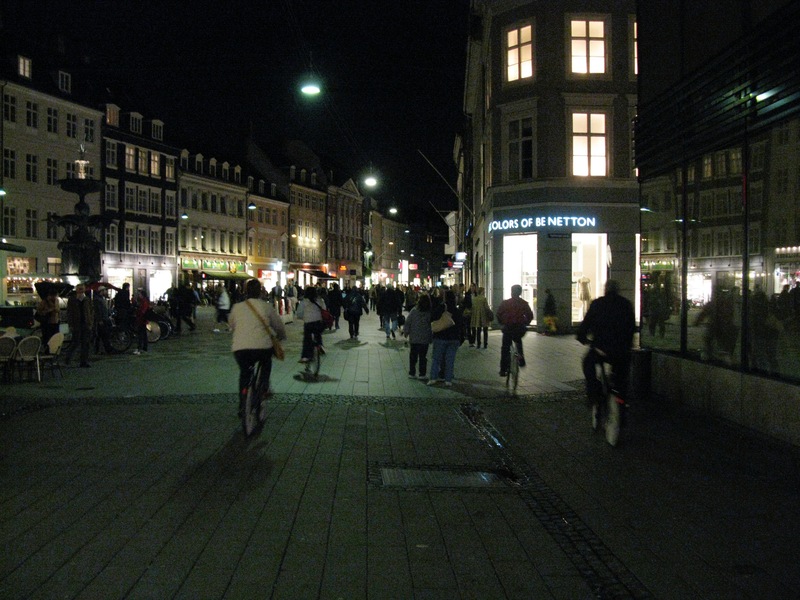 Unfortunately, there are too many black, grey and blue cycling jackets with a couple of reflective stripes giving the illusion that they are useful for night riding. So, while reflective clothing and reflectors can help, they are definitely no substitute for lights and white clothing. Thanks for this article, Richard. Total agreement. I am still enthralled with that beautiful neon blue glow in the dark bike frame I saw one dark night…not a chance I, or anyone, could have missed it. From what I understand, the frame is painted white, then painted with this extremely effective glow in the dark paint that charges very quickly and lasts hours, though some colours are more effective than others. Nothing like the glow in the dark stars of my childhood though, the technology has really come a long way! I’m telling you, it was a sight to see, and I viewed it from behind the wheel on a very dark street at a stop sign. Gorgeous colour blue as well. The last advantage I’ll mention of course, is that a bike that stands out so gloriously is a less attractive target for thieves!